My favorite Saturday of the year is coming up this weekend — Especially Me Super Saturday! This is a special day when I (along with about 25 other trained volunteers) get to teach a group of wonderful 5th grade ladies in Long Beach the skills they need to be happy and confident, to make good decisions, to be assertive, to express themselves, and to have a strong sense of self. The goal being to instill the idea in each young lady that she is unique and special. That she can take control of her life. How we do this? By providing tools to build and maintain self-esteem, providing correct information about the body, providing decision-making skills, and helping to set meaningful goals. I am counting down the days until I get to have my classroom of girls and we get to have open conversations about what we believe and are experiencing, and I get to share advice and input from my life growing up. I think back to when I was in 5th grade and I wish I would have had a safe environment to discuss these thoughts, doubts and changes I was experiencing. What’s so cool, too, is that we are building this support system through The Confidence Post and through our community events, such as Especially Me! and Confidence & Me. 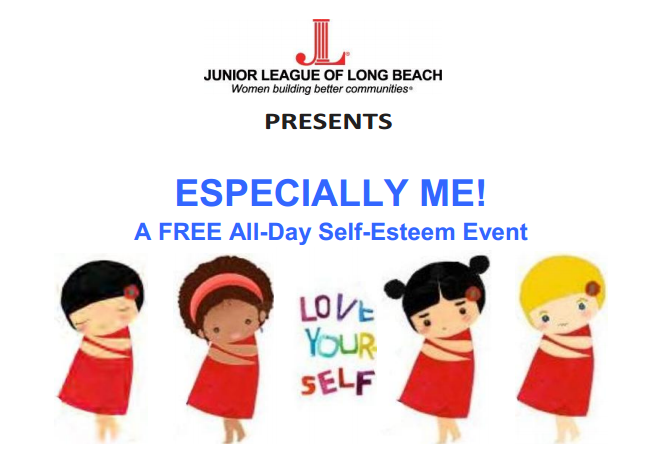 Confidence & Me – A Toolkit for Empowering To-Be-Teens is our new self-esteem and bullying prevention programming in the Long Beach community put on by the Junior League of Long Beach. These self-esteem & bullying prevention events are kicking off this Spring and the events will focus on boys and girls in 5th through 8th grade (caregivers also are encouraged to participate) and are designed so attendees can participate throughout their middle school experience. Our hope is to develop ongoing relationships and interactions with students throughout their journey during these formative years, providing a toolkit of resources, knowledge and skills. I encourage you and any others you know that could benefit from our in-person programs to get in touch with us, whether it’s through contacting us on this blog or emailing us at community@jllb.org. Whether you are experiencing this as a student, or if you have a loved one who is in 5-8th grade, please share this! It is so important that we take care of each other as a community and be each other’s support systems. There never can be too much support and knowledge! This entry was posted in Bullying Prevention, Character Development, Self Esteem and tagged #bullyingprevention, #community, #confidence&me, #especiallyme, #JLLB, #selfesteem, #theconfidencepost. Bookmark the permalink. We’ll See you this Saturday at the 10th Annual Kids in the Kitchen!